Lastly, in Charles Kirk's weekend report from The Kirk Report, he included the below chart detailing the triple top pattern that has formed for the S&P 500 Index. "On a very short-term basis (30 minute view), it appears we’ve seen a triple top type trading range breakdown reversal that has hindered that 2280 target from being acquired. 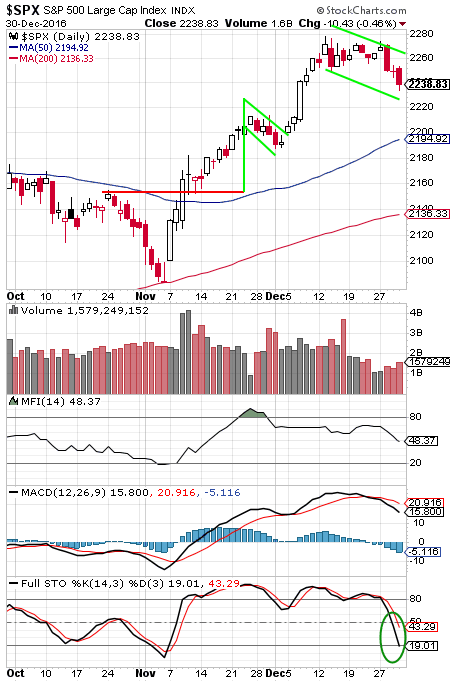 This has also formed a new potential bull flag formation. It would be unusual to see a major market reversal/correction begin from this kind of consolidative formation." "Pullbacks, reversals, and corrections begin with one bearish play seeing successful target acquisition followed by other larger ones. At the moment, at best we have seen one minor reversal play out last week, but whether another bigger reversal play now forms and fires from here is something we will be watching for as trading gets underway this new year. We’ll be concerned if we see a strong downside move back below 2180." So, as the new year begins and sentiment is decidedly bullish, the technical picture continues to lean bullish. The consolidation that took place at year end may position the market for a decent January, at least through Inauguration Day.